Texas and Manitoba played a pretty sleepy Sunday afternoon game in Winnipeg this afternoon. 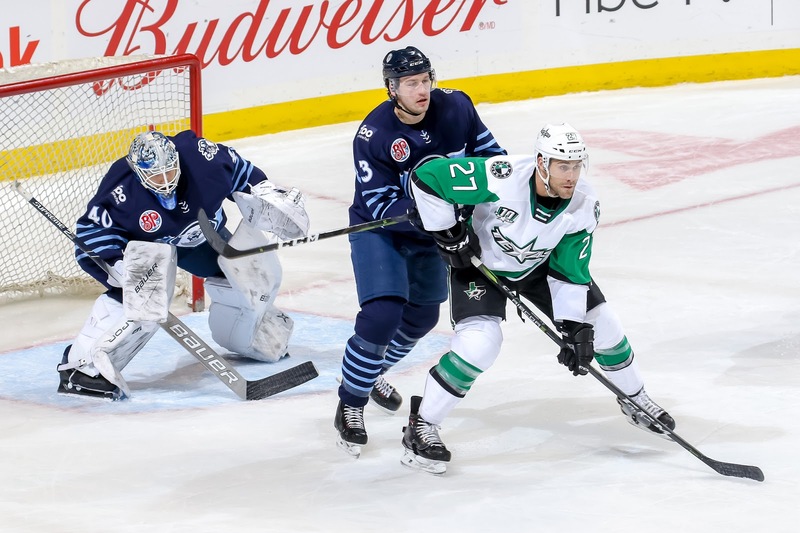 The host Moose bested the Stars 2-0 on a third period tally and an empty net goal late as Texas pressed to tie. Philippe Desrosiers got the start and played well, stopping all but one of the 32 shots he faced on the night. It was only the second time this season that Texas has been shutout, the other time being a 4-0 loss in Tucson on January 23rd. Mikhail Berdin, just recalled from the ECHL, got the shutout win with 34 saves. Joel L'Esperance had one of Texas's best chances of the contest in the first period as he rang one off the crossbar on the power play in pursuit of his 27th goal. His current 26 tally leads the league. Texas finished the first with a clear shots lead at 15-9. Texas got flipped in the second as Manitoba led 12-7 in the frame. The game-winning goal came on an icing clear. The Moose sent the puck down the ice, and Seth Griffith beat the icing call. Phil Desrosiers came out to play the puck, sending it around the boards right to Marko Dano. The forward slid it over to Logan Shaw in the slot for the 1-0 tally. Texas would try for the equalizer late but their first chance 6-on-5 ended up with a faceoff win for the Moose and the puck in the back of their net. The final would be 2-0. The Stars are back in action in Rockford on Tuesday.